In order to ensure that toll collection for trucks on autobahns runs properly, both image processing and communication between the toll gantry, the truck and the control room must run without impairments. The equipment must be optimally protected even under the most difficult outdoor conditions. Vitronic, the specialist for industrial image processing, has established an efficient system together with HARTING as a partner for connection technology and networking. The Vitronic system uses the so-called TollChecker, an automatic monitoring device for route-specific HGV tolling, to identify and classify trucks with a weight over 12 tons in the flow of traffic (pictured above). Based on the number of axles and vehicle geometry, the device checks whether the vehicle is liable for a toll charge. The system is able to identify vehicles for which incorrect or no tolls have been paid and sends a data record as evidence - encrypted for security purposes - to the control center. Vitronic&apos;s recognition system used above highways. The system provides fully automatic monitoring across the entire width of the autobahn. irrespective of vehicle speed or lane-changing maneuvers. If required, the data can also be sent to a manually operated terminal for the offending truck. The Vitronic TollChecker measures the vehicles three-dimensionally. It uses the data to create a geometric vehicle model, determine the number of axles and recognise any trailers. The system identifies the shape of vehicles and assigns them to different tariff classes. A general image of the truck and an image of the license plate are acquired with the help of infrared flash lighting which is invisible to drivers, and the license plates are automatically read. The information acquired by the monitoring system is then compared via interfaces with the data of an on-board device in the vehicle or with records held at the control center. If there is any suspicion of toll dodging, a data record is generated as evidence. The equipment for image processing and the contacts of the connectors require optimum protection to safeguard their ongoing functionality. When designing the toll system, HARTING and Vitronic were able to draw on many years of experience in industrial environments. 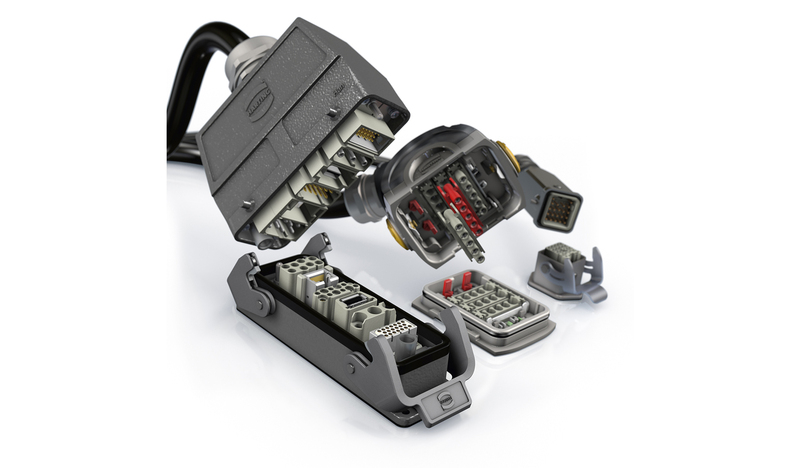 The use of the Han® connector housing in combination with Ernst & Engbring cables make it easy to connect the equipment. The high degree of protection of the connector housing means that cold, wet, hail or snow cannot affect the connections. Network integration of the toll gantries works perfectly, so that the communication between vehicles, toll gantry and control center is not interrupted. The project shows that the industrial know-how of HARTING and Vitronic can also be used successfully in other sectors such as road traffic. Han® connectors (Han® M, Han® 3 A, etc. ): suitable for the most demanding environments and not only for industrial environments.